Here is the official Exodus rules for the Exodus Trading Card Game. Learn to play this easy, fast, fun game! Welcome Drifter! As you take your first steps into Eeventide, there are some basic rules that you need to know. If you take these to heart, you’ll be on your way to becoming one of the greatest card mavens of all time! At the start of a game, each player begins with 10 Life Points. The game objective is to get your opponent’s Life Points to 0. If at any point during a game a player’s Life Count reaches 0, they lose. In other words, if you diminish your opponent’s Life Point total to zero before they deplete yours, you win the duel! Life Points – “Life Points”, “Life Count”, and “Life Total” are all interchangeable terms. They refer to number of points each player has during the game. Symmetries – “Symmetries" or "symmetrics" is the plural form of a Symmetry Card. It can also refer to the effect(s) caused by an activated Symmetry Card. 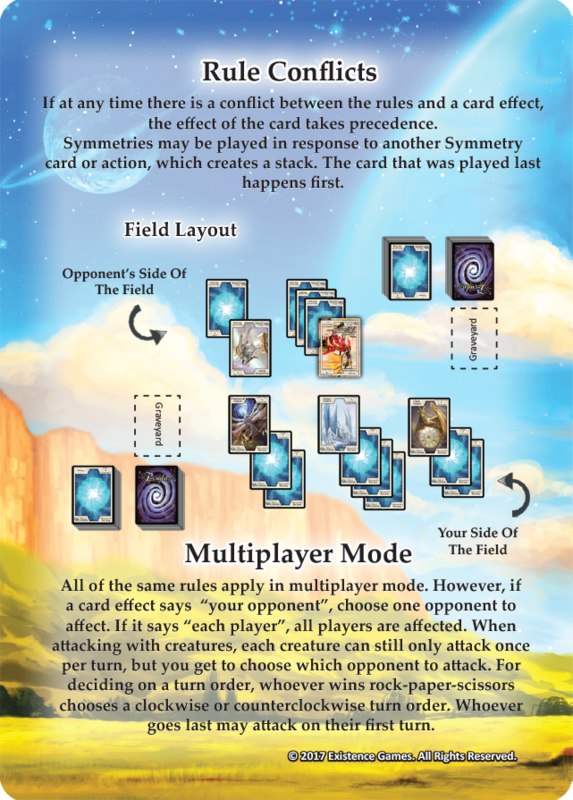 A symmetry card can be used like an Instant or a Counter effect during a game. 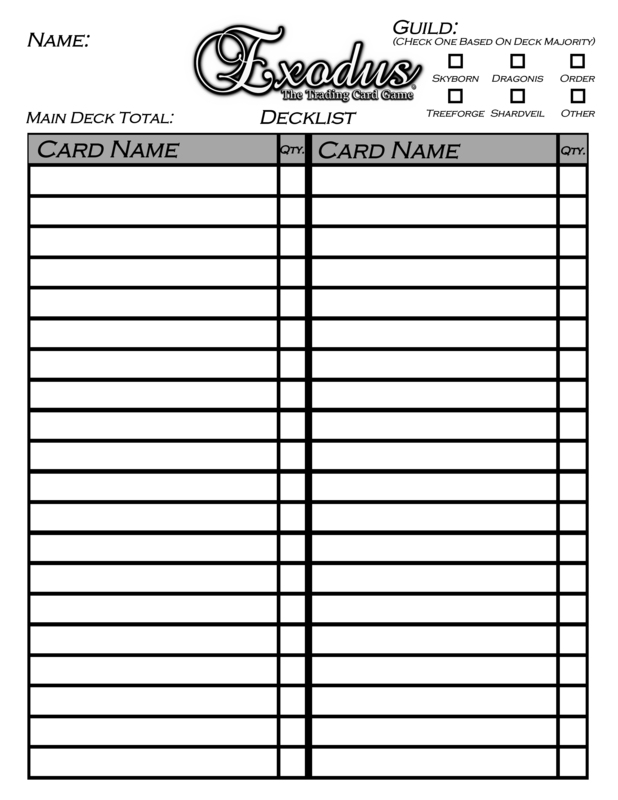 Deck – Decks generally represent all of the cards that belong to a player. A deck is like the arsenal of weapons at a player’s disposal. This arsenal is composed of mind-blowing creatures and powerful symmetries that will devastate an opponent and ultimately lead you to victory! Certain terms such as, “Main Deck” and “Energy Deck” refer to specific parts of a player’s complete deck. 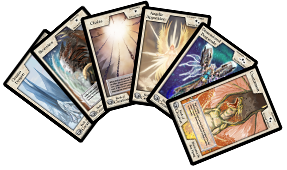 Creatures – “Creatures” is a term that refers to cards that say "Creature" above the rarity star(s). Turn - A “turn” is a single player’s chance to play. A turn is broken down into phases or steps in which the player must follow each turn. Phases – “Phases” and “Steps” are interchangeable terms. These refer to specific parts of a turn, which are conducted in a certain order and are used to carry out actions during gameplay. Match – A “match” is a best-of format based upon a set number of games. A normal match consists of 3 games, and the player who wins 2 out of the 3 games is considered the winner of the match. 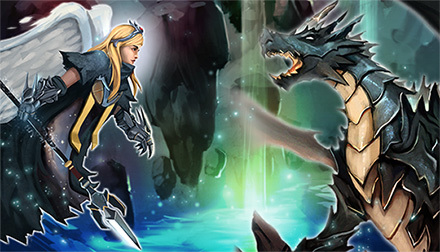 There are three types of cards in the Exodus TCG and they each play a vital role. Energy Cards – Energy is the most basic card type. It is what fuels each and every creature and determines how powerful they are. A single energy is represented by a single energy card. 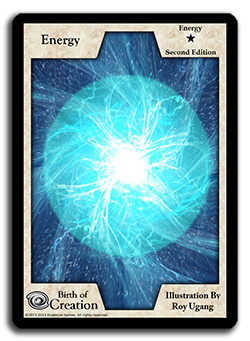 Each player must have a minimum of twenty (20) energy cards in his or her Energy Deck in order to play. Of course, each player also needs 20 cards in their Main Deck (which is composed of Creatures and/or Symmetry cards) for a minimum 40-card deck in order to play a game of Exodus. Symmetry Cards – Symmetry cards are are instant effect cards that put a twist on the game’s mechanics. They affect gameplay in a positive way, negative way, or both. These kinds of cards can be crucial to the victory or turnaround of any game or match. Symmetry cards act as a sort of instant and occur immediately. They can also be used as a counter move or counter effect. Just remember, whatever the card says in the text box is what it does, so read each card carefully. Symmetry Cards as a Response – Symmetry cards can be played at any time during the game; they can be played on any phase during any player’s turn and happen immediately. But remember, they can also be played as a response to an action or play. When your opponent plays a symmetry card, you can play a symmetry card of your own as a response. By doing this, your symmetry card’s effect takes precedence even though your opponent played first. This causes the effects to stack, and the card on top of the stack occurs first. Of course, your opponent can play a response to your response, so think carefully! There is no limit to how many cards can be on the stack or by whom the response is played. 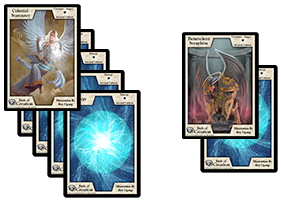 For example, you can play a symmetry card in response to your own symmetry card, causing your symmetry cards to stack or combo. Creature Cards – Finally, we have creature cards. Creatures are the main weapons that drifters use to perform combat and deal damage during a duel. Fictionally speaking, in the world of Exodus, creatures come from the cards themselves and are driven by the energy which is strategically placed on the field. With that said, creature cards by themselves are all the same. They have no attack or defense numbers on the card. Instead, the power of a creature is determined by how big a pile of energy is that it is attached to. The other elements that differentiate creatures are the types (Dragon, Angel, etc.) and rarity star(s), which are affected by some cards. Nearly all Rare (and above) creatures have a unique written Ability. 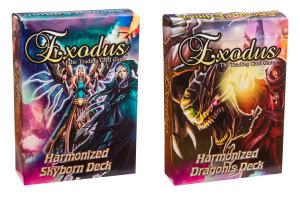 Before you begin a game of Exodus, you’ll need a deck and at least one friend with a deck. Each player’s deck will be separated into two smaller decks for gameplay: the Main Deck and the Energy Deck. 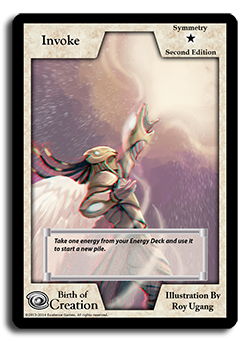 Our Harmonized Starter Decks come with twenty cards for your Main Deck and twenty cards for your Energy Deck, for a grand total of forty cards. However, there is no limit to how big a deck can be. Forty cards is just the minimum. Each player must go through their deck and separate their Energy cards from everything else. All of a player’s Energy cards are placed face-up in their own stack and counted as their Energy Deck. All of the other cards aside from the Energy are shuffled and called their Main Deck. The Main Deck is placed face-down next to the Energy Deck. After doing this, each player may cut the opposing player’s Main Deck. Play a quick game of rock-paper-scissors to determine who goes first. Once this is decided, the game may begin! 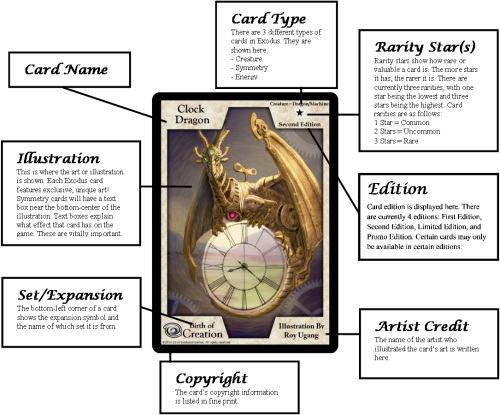 The Main Deck – The Main Deck is composed of creatures and symmetries. 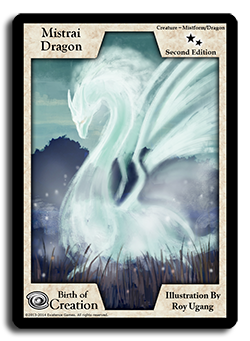 These are represented in the two different card types: Creature cards and Symmetry cards. Creatures are used to do battle and deal damage to your opponent. Symmetry cards are like instants or wild cards and put a twist on the game through their card effects. Main Decks cannot contain more than two of the same card title; you can't have more than 2 copies of a card in your Main Deck, whether it be creature or symmetry. The Energy Deck – All Energy cards will go in this deck. Energy cards represent energy. Energy is used like fuel to drive creatures into battle. The more energy there is in a pile, the stronger the monster will be. Although there are twenty cards in the Energy Deck, they are all exactly alike. Each card represents a single energy. Any energy that is "destroyed" or "discarded" is simply placed back on top of the Energy Deck. The Main Deck and Energy Deck are placed side by side during the game. Although they are separated for gameplay purposes, they are considered to be your "Deck" as a whole. The green cards represent the creatures in play and the yellow cards represent the energy attached to the creatures. 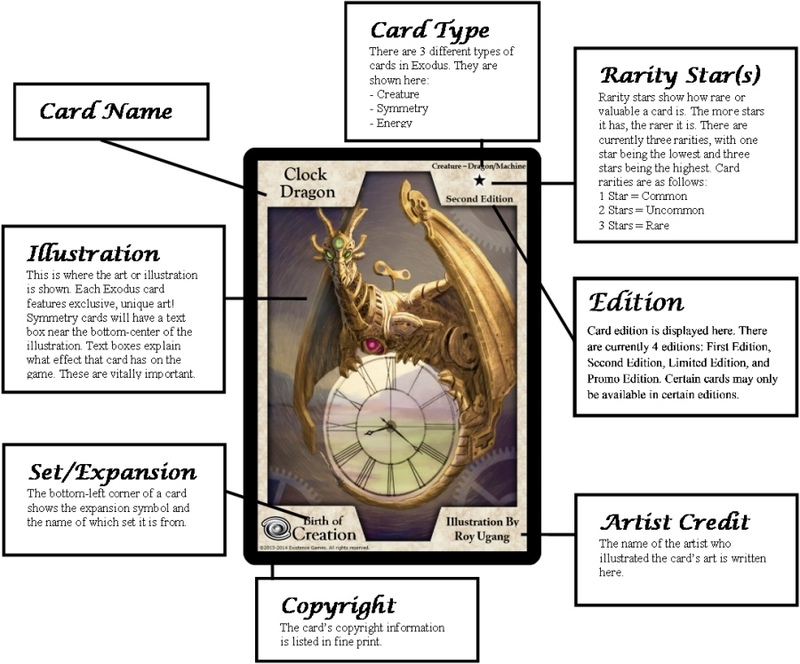 The labeled cards at the bottom of the diagram represent what your side of the field might look like. The cards at the top show your opponent’s side of the field. Off to the side, you can see the deck area in blue and their respective graveyards. 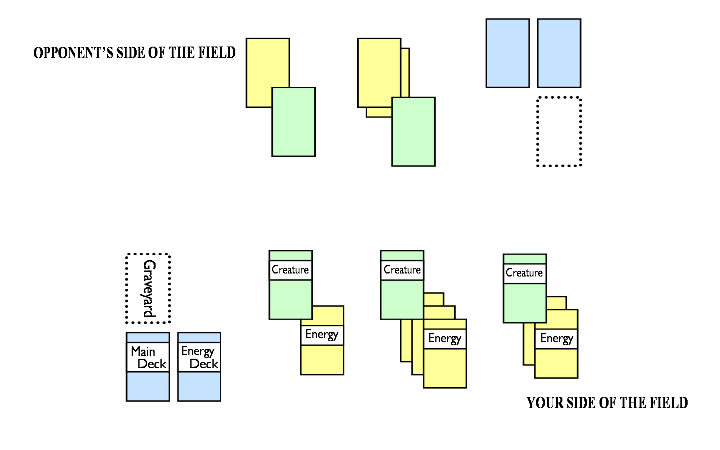 This diagram shows where cards are placed during a game of Exodus and what the playing field may or may not look like at any point during a match. Remember, Symmetry cards can be placed anywhere on the field briefly, until their effect(s) occur. They are then immediately discarded to the graveyard after use. Some creatures have an effect on the game called an "Ability". Creature Abilities will have a name (e.g. "Forged From Stars"), followed by text that describes exactly what the effect does while you are playing. If a creature Ability starts with "When this creature is summoned...", its effect only happens once when you summon it on a pile of energy. Its effect may happen again if it leaves the field and is then summoned again at a later time. 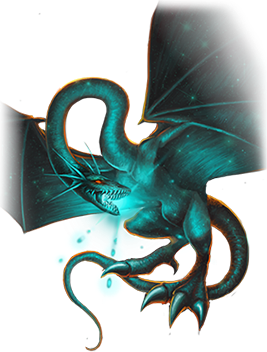 Other Abilities may indicate that the creature does something special when it attacks, or that it causes something to happen as long as it is on the field. 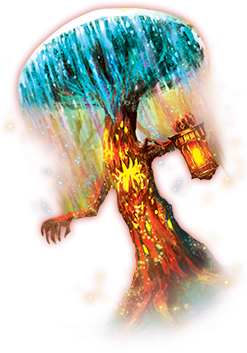 Creature Abilities are only active while they are on the field; they do nothing while the creature is in your Main Deck or graveyard unless they otherwise say so. Some powerful cards require you to "Pay 1 energy" as the first part of its effect, for example. 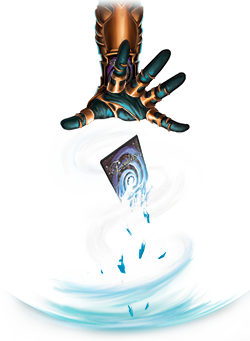 When you need to pay an energy cost, you can pay from any available energy in your hand or on your field by discarding it back to the Energy Deck. - i.e. If your opponent plays Vortex and they only have 1 energy on their field (which they are going to use to pay the cost), and you play a Cataclysm in response and destroy that energy, their Vortex will go straight to the graveyard without happening since there would be no energy to pay the cost. - Likewise, if your opponent plays Unsummon on your only creature on the field, you may stack/play Reversion on your own creature to send it back to your hand. The opponent's Unsummon would then have no available targets and go straight to the graveyard without happening, and your opponent would not have to pay its cost. The game starts off with each player having a total of 10 Life Points. 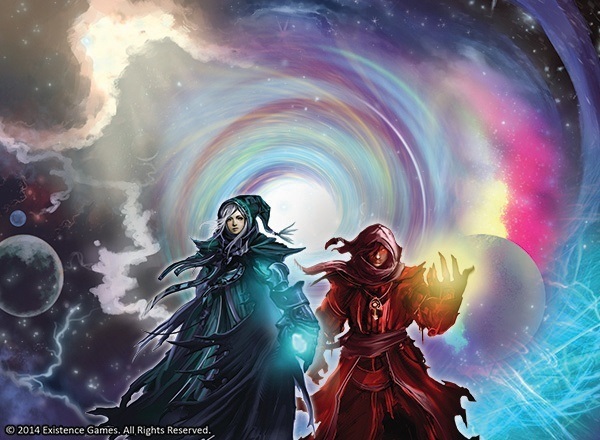 They then each draw three cards from their Main Deck and three cards from their Energy Deck – a six card starting hand. Note: Each player’s Draw Phase is skipped on their first turn. This means, at the very start of the game, every player still draws six cards, but they do not draw again when they begin to make their move. The starting hand should be plenty of cards to work with. 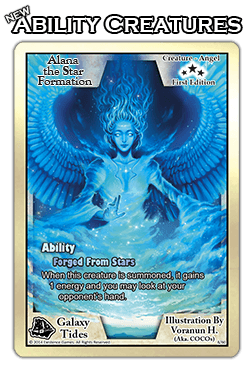 From here on out, at the beginning of any player’s turn, they repeat the draw step by drawing another three cards from their Main Deck and Energy Deck. Although it is only the start of the game, a lot can happen in the first turn. Whoever goes first can start building piles of energy, play creatures, and use symmetries as usual. However, they cannot enter the Attack Phase this turn. On the other hand, the player who is standing by can still activate Symmetry cards in response to the starting player’s actions, if they wish. A game progresses through a turn system. The turn system begins at beginning of the game, starting with the player who goes first. From there, players will alternate taking turns until someone wins. A turn consists of 5 Phases. These 5 phases, or steps, must be followed in the designated order every turn. If you cannot perform a particular phase during any given turn, skip it. Some Key Rules to Remember: As you learn to play the game, it is important to remember some of these key points. They are mentioned throughout the rulebook in their specific section, but here is a short list to make finding them a little bit easier. Once you memorize these, it'll be smooth sailing from there. • Once a creature is placed on an energy pile, it is no longer considered a pile, but is instead considered a creature (with x amount of energy). *NOTE: If a card says, "Pay 1 energy," you can pay by discarding an energy from your hand OR your side of the table, no matter if it's from a creature or a blank pile of energy. 1. 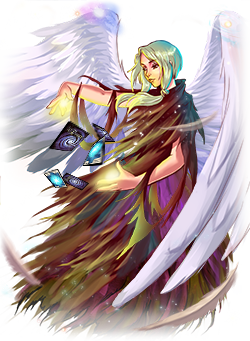 Draw Phase – Draw three cards from your Main Deck and three cards from your Energy Deck and add them to your hand. 2. 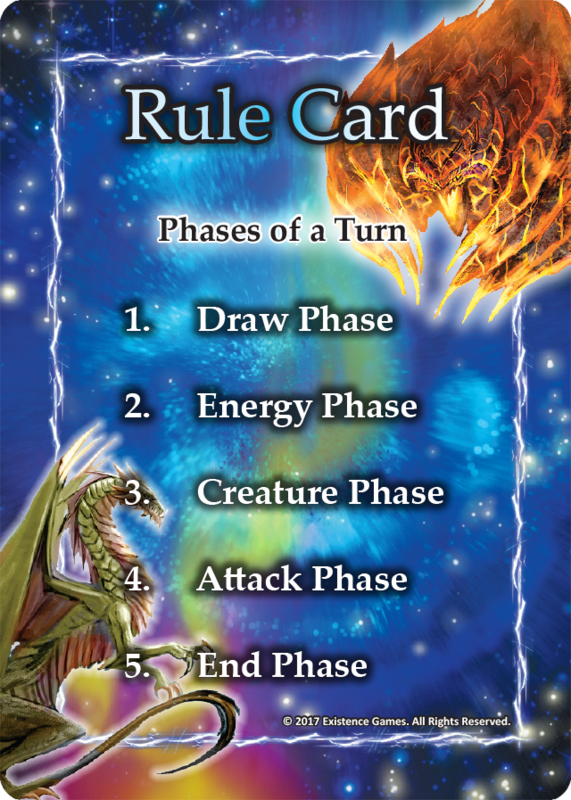 Energy Phase – You may play any energy from your hand to the field. When you place an Energy Card onto a blank space on the field, this is called, “starting a pile”. You may also add any energy from your hand to an existing pile with no creature on it. This is called, “adding to a pile”. Each pile without a creature on it may not exceed three energies unless otherwise specified by a card effect. There is no limit to how many piles there can be on the field. While you do draw three Energy Cards each turn, you are not required to play them. You may play any number of energies from your hand during this phase (including any energy you may have saved from a previous turn) or none at all. It is, however, recommended that you play as much energy as you can, as often as possible. 3. 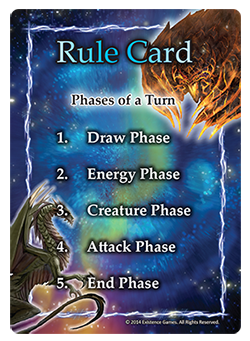 Creature Phase – During this step, you may play a creature from your hand onto a pile of energy on the field. Only one creature per pile is allowed, and like energy, there is no limit to how many creatures are allowed on the field. There is also no limit to how many creatures you can play per turn, assuming there are a sufficient number of separate piles of energy already in play. Once a creature is put into play, no more energy can be added to the attached pile unless otherwise specified by a Symmetry Card. 4. Attack Phase – You may use any or all of your creatures to attack your opponent’s creatures. If, and only if, your opponent has no creatures in play, you may attack their Life Points directly. Your opponent is dealt the same amount of damage equal to the number of Energy Cards attached to the attacking creature (each energy card counts as one point or one point of damage during an attack). If they have no creatures, but have piles of energy in play, you may not attack and destroy those piles. In other words, you cannot attack and destroy creature-less piles. As alternatively stated, you could still bypass their vacant piles of energy and attack their Life Points directly, or you could choose not to attack at all. If your creature attacks another creature, they both receive damage at the exact same time, regardless of which one is attacking and which is defending. Any energy that is removed from a creature is removed from the field and placed back into its respective energy deck. If your creature with two energy attacks an opponent’s creature that has one energy, your creature loses one energy and the opposing creature is destroyed. Any creature that is destroyed is sent to the graveyard (a face-up pile next to the deck) and any energy that was attached to the destroyed creature is cycled right back into the Energy Deck. Likewise, if your opponent’s two-energy creature attacks your one-energy creature, yours is destroyed and your opponent’s creature is left with one energy. If two creatures conduct battle with one another and they possess the same amount of energy, they are both immediately destroyed and sent to the graveyard. The energy that was attached to each respective creature is still cycled back into the Energy Decks. Note: If your creature(s) attack your opponent directly, your creature(s) deal damage to their Life Points equal to the amount of energy attached to them. However, unlike creature-to-creature battles, your creature(s) lose no energy in return, from the attack. For example, if it is your turn and your opponent has no creatures to defend with and you have a five-energy creature, you could deal 5 points of damage to their life and your creature would stay alive at 5 energy! Each of your creatures may only attack once per turn (unless otherwise specified by a card effect), whether it is against an opposing creature or your opponent directly. But remember, you cannot attack their Life Points until they have no creatures to defend with. Reminder: Any and all energy attached to a destroyed creature or a creature that was dealt damage is cycled directly back into the owner’s energy deck. 5. End Phase – Nothing in particular happens during this step, except for the signaling for the next player to start his or her turn. Remember, even though it will now be your opponent’s turn, you may still activate and use any Symmetry Cards that remain in your hand. 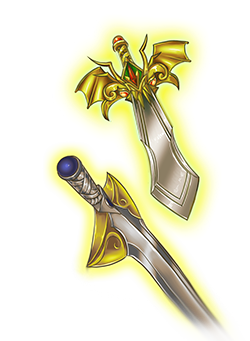 These can be used at any time, during any phase, on any one player’s turn. These are played anywhere on the field, face-up, and the effect(s) are activated immediately. After the effect(s) has occurred, the Symmetry Card is discarded and moved to the graveyard. These steps are repeated in the same order at the start of your next turn. After the starting player makes his or her move, it is the second player’s turn. The player who goes second also skips their draw phase during their first turn and follows the Phases of a Turn in order. Their move may look similar to player one’s turn, but they now have a new option: They can attack! 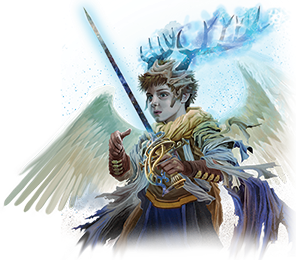 From this point forward, a player may attack with any or all of their in-play creatures during their Attack Phase. After the second player ends his or her turn, it becomes the first player’s turn again. The same steps are repeated each turn until someone wins. - When a symmetry card or effect is played in response to your symmetry card, the card played most recently (card on top of the stack) happens first. Then, any remaining cards that must resolve experience Playback and may change targets if the owner chooses. - Playback also happens when a creature is attacking and some other card effect causes a target to change or the state of the field to change. In this instance, Playback takes place and the attacking creature may change targets or stop attacking all together! Winning a game or match is simple. All you have to do is use your creatures to attack your opponent and deplete their Life Points to zero! On the flip side, if they knock your Life Points down to zero first, that means they win. If you do lose, be polite and accept defeat. The game is more enjoyable when everyone is a good sport! If you find yourself repeatedly losing, try shuffling your cards better or use different strategies. Strategic gameplay can be the key to turning the tide of a duel. You may also want to try adding new cards to your Main Deck or switching out certain cards for different ones. Or, you may want to try using a whole new deck altogether! Powerful new cards are always being added to the ever-changing world of Exodus and getting your hands on these may be just the thing to increase your chances of winning. All of the same rules apply in multiplayer mode. The only difference is, when a symmetry card’s effect targets an opponent or an opponent’s card, you select one opponent for the effect to affect. Likewise, during creature battles, each of your creatures can still only attack once, but you get to pick and choose which opponent to attack. After the game begins, the Attack Phase becomes available starting with the first turn of the player who goes last. For deciding on a turn order, whoever wins the game of rock-paper-scissors goes first and they get to choose a clockwise or counterclockwise turn order. What Happens When I Run Out of Cards to Draw? Sometimes, a game will last long enough for you to draw every single card from your deck. If and when you draw the last card, immediately take your face-up discard pile (graveyard), shuffle it, and place it face-down in your Main Deck area (it is cycled back into your main deck) to continue drawing. This means that all of the cards in your graveyard become your deck again. Yes, all of those dominating cards that have helped you thus far will come to your aid again! In turn, this means that it doesn’t matter if you run out of cards. You simply shuffle and cycle your discarded cards back into your deck and continue playing. The game cannot end until one player is left standing with their Life Points above zero. If at any time there is a conflict between the standard rules and a card effect, the effect of the card takes precedence. In fact, some cards are designed to bend the rules a little bit. Some of the rarer cards bend the rules a lot. However, a card that has an impressive effect usually has a hefty fine in order to use it. It may seem uncanny, but these kinds of surprises make the game more interesting! Use all of the energy from your hand every single turn. Start piles of energy according to the number of monsters you draw, so that you always have a full field and a near-empty hand. When it is your turn and you draw three new Energy Cards, put them into play in any arrangement that you like. Save any creatures in your hand. Then, use the Chains Symmetry Card to stop your opponent from attacking on their next turn. After your opponent completes their attack-less turn and you draw three more energies, add these to your existing piles on the field. Then, bust out as many creatures as you can! 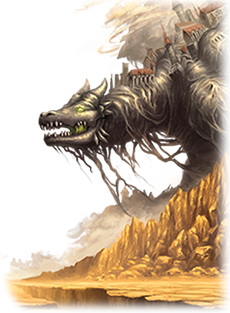 If you’re lucky and you play the cards right, you’ll have a large number of well-rounded beasts in play to crush your opponent. Use Symmetry Cards as soon as you draw them. This will increase your energy-per-monster rate and help you draw better cards faster. You may also want to try to save a few Symmetry Cards and then activate them all at once for a gigantic effect! Well, that’s about it. Now you know the official card games instruction of Exodus The Trading Card Game. You've also learned how to play and win a game of Exodus! Be sure to keep an eye out for future expansions, decks, and booster packs for sale. We’ll see you in the next dimension!